Changes to the Apetito frozen menu! Along with the changing of the season comes some big changes to the Apetito meal selections provided by our primary frozen meal distributor. Eight new meals have been added to the menu this season, while eight others are being retired. As well, the base sauces for the majority of the existing meals have been given an upgrade— creating creamier and more flavourful sauces. The mashed potatoes are also being upgraded, as well as many other tweaks have been made to improve the meal flavour, texture, and presentation. Look for meals labeled “New Recipe” in your order bag starting this month. 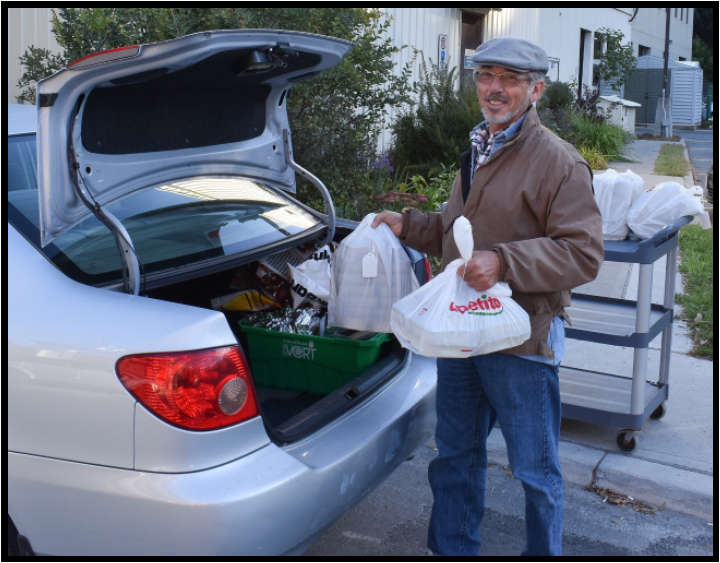 Meals on Wheels volunteer Rhéal is loading frozen orders for delivery to our East end clients. Please note that there have been changes to the names and codes for several products. The new menu is available on our website, or a paper copy can be requested by calling us at the office at 613-233-2424. We will be including the new menu version in frozen order packages for part of October. If you have any allergies, we recommend you review the updated nutritional information from the link on our website, or call our office before placing your next order. Please note that 12142 Chicken with Mushroom Gravy and 12143 Seasoned Pork Loin are no longer gluten free, although the order numbers will be staying the same.